This year has brought some new projects to my garden. Among those are a compost tea brewer and blueberries! I wasn’t sure I wanted to battle the birds and raccoons for my share of berries, but I survived last year with the new raspberries, so why not give it a try! I spend a fortune on organic berries, so having them in my own garden is a fabulous treat and a real money saver. Since my soil is nowhere near the acidic pH that blueberries prefer, I decided to go with containers filled with planting mix for acid loving plants. I chose EB Stone’s Azalea, Camellia, Gardenia, Planting Mix. At the bottom of each pot is a nice layer of bark, to provide better drainage. From what I understand, blueberries like a fair amount of water, but don’t want to have soggy roots. I used the same bark as a mulch layer over the soil. The O’Neal and Jubilee blueberries are each in their own 25 gallon bucket, and will get as much as 6′ tall. They aren’t known specifically to grow in containers, so I wanted to give them as much room as possible. The third variety, Sunshine Blue, is in a 15 gallon bucket and will only get 3′ tall. He’s known to do well in containers. Gardening is just one big experiment, so we’ll see how this one goes! From what I’ve read, blueberries need to cross-pollinate each other, so it’s best to choose at least two. I chose three varieties with different fruiting times, so I may enjoy a variety of berries throughout the season. That is, if I can keep the birds away! 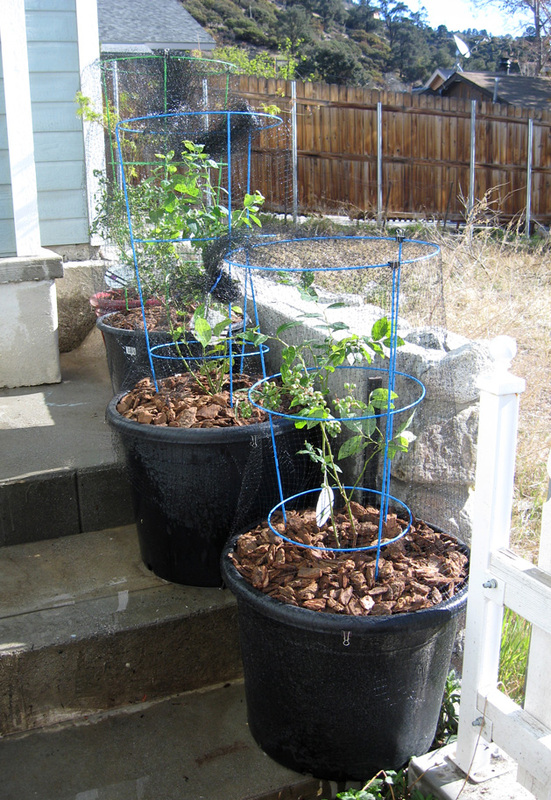 As you’ll see in the photo, I’ve constructed some temporary protection out of bird netting, fastened around small tomato cages. As the plants grow, I intend to build a nicer structure that’s easier access for me to go berry picking, and keep the critters out. These plants are located on the Eastern side of the house, and will only get morning sun. They’ll be spared the hot, afternoon sun. Let’s hope they like their new home! did not know about the cross-pollinating.. perhaps THAT is why I’ve never had a big crop of blueberries. for now we’re adjusting to what is possible to do up here. Ron has always been real big at gardening.. when we first met, he was helping his mom pay the rent – and she didn’t let him garden (or BBQ, his other big joy). then we were in an apartment.. then a teeny tiny guest house. now we have our own place (and & “real” yard!) and we can’t water. I have had potatoes inside so far, & the tomatoes are starting to grow in now. we are planning to set up an aquaponic system once I find work.